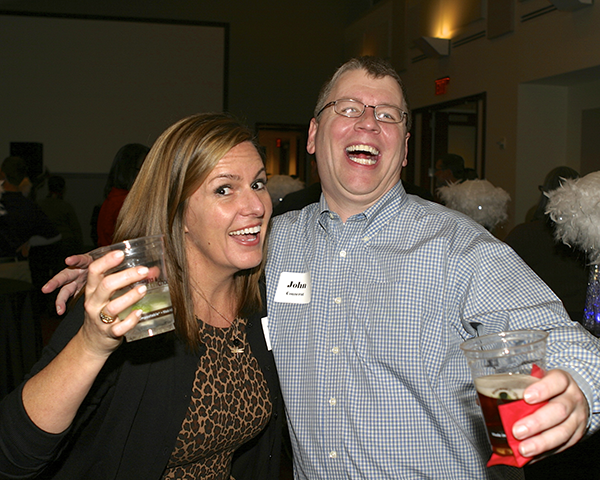 It just wouldn’t be a party without the Dana Haggas/John Connerat Pose! The first-ever LITS Holiday Party, held on December 16 in the Goizueta Business School, was a roaring success! With almost 300 LITS employees in attendance, party-goers ate, drank and were indeed merry as they danced, sang, and pretend-gambled the night away. The Holiday Planning Committee wanted to make this event the best holiday party that the former OIT and Library divisions had seen and, with their combined resources, they were able to dramatically upgrade the food, decorations, and entertainment. While Darryl Durggin and Anne Marie Alexander watch, Laura Smith rolls a seven. The party dipped into Atlanta’s thriving casino event entertainment industry by bringing in Atlanta Casino Events to create a real casino atmosphere that featured craps, blackjack, and roulette tables, all manned by professional croupiers. Party attendees were given $5000 in play money, which they cashed in for gaming chips. 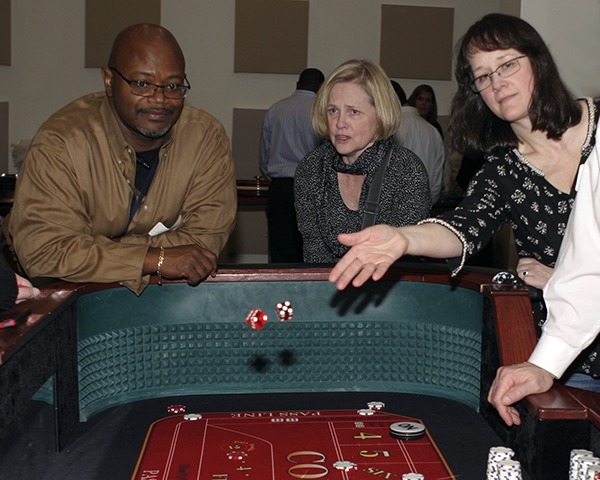 At the end of the night, players could exchange their winnings for raffle tickets. The DJ for the event was JJ Chase (JJ the DJ) and he hosted the music, dancing, karaoke, and raffle. 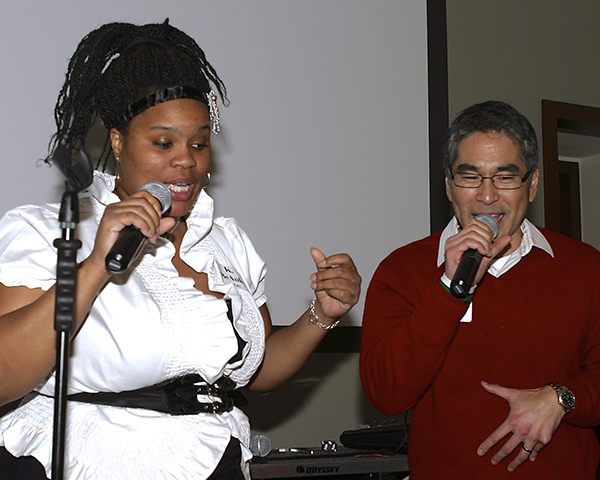 The karaoke was surprisingly popular and demonstrated that a few LITS employees can actually sing. A few, anyway! BéAnka Tate and Alex Wan do a rousing rendition of “Proud Mary,” complete with dance moves. The food was provided by Emory Catering and drew compliments all evening. The highlights from the menu included the Crab and Artichoke Dip, the Bison Meatballs with Green Onion Dijon Aioli, the Monteray Jack Smashed Potato Cup topped with Braised Short Rib and Garnished with an Onion Ring, the Sea Salted Bitter Sweet Chocolate Truffles, and the wildly popular Biscoff Banana Pudding Cups. 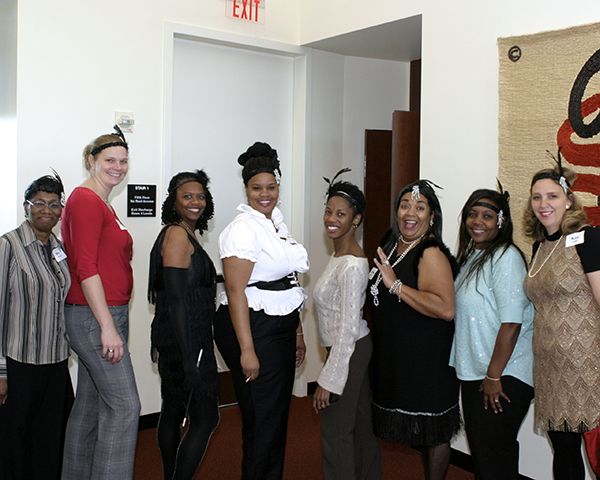 The LITS Holiday Planning Committee (L to R): Bev Turner, Amanda Welter, Sandra Harrison, BéAnka Tate, Amber Jefferson, Bonita Russell, Enid Britton, Kim Collins. Not Pictured: Julie Braun, Wicki Mitchell, Wade Moricle, Alex Wan. To give feedback regarding the event, please see this short survey. If you did not get an opportunity to donate to the Employee Hardship fund, it’s not too late. You can make your donation here. The LITS Holiday Planning Committee wishes to thank the countless volunteers who helped make this year’s event such a big hit. A special thank you from the decorating committee to Kathy Dixson and John Klingler (both of University Libraries) for the reprise of some of MARBL’s Portrait & Text: African American Artists of Dance, Music, & the Written Word exhibition and to Norman Hulme (UTS) for the poster production. This entry was posted in News and Events and tagged Business and Administration, Call Center, DAR, Enterprise Services, Integration, ITSMO, LITS Holiday Party, R-WIT, University Libraries. Bookmark the permalink. Post a comment or leave a trackback: Trackback URL. What a terrific gathering! It’s obvious that finding more opportunities to network and meet the awesome people that comprise LITS is so very important…thank you all for a nice time together to connect!